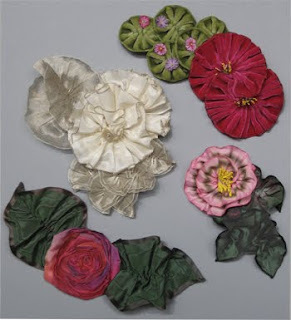 Candace Kling will be coming to Wichita for the Victorian Stitchery Retreat! Aren't the pictures of her classes amazing? 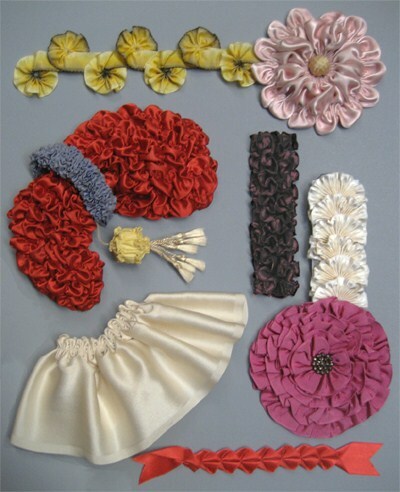 The picture above is some examples for her Vintage Ruching class. This picture has some examples of flowers you would learn in her fabric flowers class. I think they are beautiful and they look just like the flowers that everyone is wearing this fall! 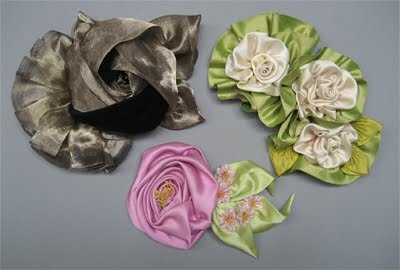 Here is a picture of her ribbon flower class, and again, they are amazing! If you would be interested in any of these classes and can come to Wichita, you may email me at pinkbunny@valeriebothell.com for more info. Sorry I didn't post for Pink Saturday last week, my browser wouldn't let me log into my blogger account. Remember to check in with our wonderful sponsor, Beverly. Just click on the Pink Saturday icon on the top right of your screen and she will list other wonderful blogs you can visit. Holy cow! Those are fab! Happy Pink Saturday! Wish I was closer! Hello! Happy Pink Saturday! Those are quite lovely - I'd love to see Candace making them! I hope you have a terrific time! All her work is very pretty and looks well made. I would never be able to do that now, but I enjoy seeing the works of others. These are lovely things. I would never be able to make them, but would enjoy having them. Oh those are lovely. I'd love to learn how to make them. Happy Pink Saturday! I'm a day late but wanted to stop by and see your lovely pink pictures. Happy Pink Saturday. Those look so fun to make-I wish I knew how! Happy PS!